There's been a lot of commotion in the YA community over gay characters lately. First, it was the whole debacle with the anthology that several very prominent YA authors were doing, and which they all withdrew their stories from after the editor had an issue with a gay couple in the one of the stories. More recently, it was the issue with two co-authors who were told by their editors that they needed to basically take out any reference to their characters being gay. The most common argument for why gay characters shouldn't be prominent in books, (or anything else, really) is "It gives kids the wrong impression." And what exactly is the wrong impression? This is the point where people say "That being gay is okay, and it's not." To which I say-- but it is. Maybe not to you ('you' meaning the people who are against it), but to someone who is gay, it is okay. It's who they are, how they feel. Not everyone has to agree with it, but is it necessary for so much antipathy? If it doesn't affect you directly, then it's none of your business who someone else chooses to love. There are many stories that I've read where the only gay character is the female protagonist's sassy best guy friend, and he's only there for a few snarky punchlines and to feed the female protagonist ice cream when she's pining over her insta-love crush. To me, that gives kids the wrong impression. Sure, there are those sassy gay best friends, but they have their own stories to tell, and their own romances to pine for. More often than not, the people that have a problem with homosexuality are just scared and ignorant of it. They think that if their kid reads a book with a gay main character, then that might influence their kid to become gay. How does that even make sense? Being gay isn't just a 'phase' or something that a person can decide to be one day, and then the next say "Oh, that was fun, but I'm straight again." It's just who they are. I don't want to get cheesy here, but, to quote the lovely Lady Gaga, They were born that way. Of course, society sets a double standard. For girls, it okay to hug their friends and to kiss them on the cheek and to get dressed in front of each other. But boys? "No, don't do that, that's gay!" How? The only way it would be gay is if the two people doing it were gay. And you know what? Even if one boy was gay, and the other was straight, so what? The straight boy isn't going to just magically turn gay because he took off his shirt in front of a gay guy. Come on, people. THESE THINGS ARE ONLY A BIG DEAL WHEN YOU MAKE THEM A BIG DEAL. If everyone could just be more accepting and open-minded, there wouldn't be a problem. To those people that are against gay YA characters, think for a moment about the message you're sending gay teens everywhere: you are not important enough to have your story told. You are not 'normal' and therefore should not be represented in literature. How you feel and who you are is irrelevant. If we ignore you and deny you, maybe you'll go away. The gay community has to deal with a lot of hatred and crap that they don't deserve. They have fought, and still have to fight, long and hard for acceptance that, unfortunately, some people are not willing to give them ever. Don't let this be another obstacle. So, to summarize: I totally and completely support gay characters in YA. I want to see more of their stories being told. To any authors reading this, can we please make that happen? What are your thoughts on this subject? As I said above, I welcome all opinions. But again, please remain respectful. As an LGBT person myself, I strongly agree with you. I don't like how most gay characters in YA are just side characters like you said, and I wish we could see them as the main characters. Damn straight Ashley. No pun intended. I don't see any reason for the gay community to continue to being shot down. I had a few gay friends and in all honesty there were better friends that my straight friends. You said those who are opposed to gay YA characters need to think about the message they're promoting to gay young adults. I honestly think that they have, and it's exactly the message they'd like to send. You'll find that they hate gay people in real life, and don't want them to receive any kind of respect, and they don't want them to be seen in any kind of positive light. @ Emily, I really do hope that authors will write more LGBT main characters. :) Spread the love! @CBrett60, It's true. I'm deeply involved in theatre, and despite the stereotypes about actors being gay, well, it's kinda true. Lol. I love all of my gay friends so dearly, and I've seen them be hurt by the disgusting things that people have the audacity to say to their faces. I want that to stop. @Bekka, you're right. And those people aren't very likely to change their minds. It's THIS generation, the teens and young kids of today that have to realize just how truly hurtful and prejudiced this is. And I think YA plays a very large part in that, because there are so many more kids reading today than there were a few years ago. Totally agree with this 100%. I believe it was Malinda Lo who said something along the lines of striving to write gay characters and making straight people love the relationship like they would a straight couple. I found this incredibly fascinating (and went out and purchased her book because of it). I haven't read a lot of LGBT lit (there is some in my massive tbr pile) but it definitely needs to be out there. The right book put into the right hands save a life. I could not agree with you more! Brilliant post, you summed up my thoughts perfectly. I think YA has really been trying to tackle some difficult issues. I just reviewed I Am J, and it deals with a transgender teenagers. I think people need to realize that people want to read these topics. Great post! You absolutely hit the nail on the head. It's so unfuriating when people sprout their crap against gay people. I honestly can't work my head around the issue. Who the hell cares?! Who cares who another person chooses to love? Why have people made it such an issue? Love isn't something you can force or choose. It's a natural, beautiful thing that develops on it's own free will. Who are we to even come up with rules by which love should limit itself to? As corny as it sounds - I just see love as this beautiful, pure energy and it's downright egotistical that people think they have the right to define who is allowed to share in it. So, yeah. Gay in YA? I'm totally for it and think it should be encouraged more. 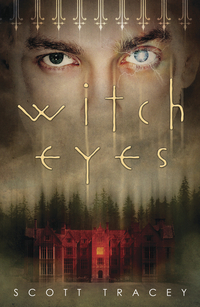 So excited to read Witch Eyes! Thank you! I completely agree. freshman year i wanted to join the GBLST club in my school but didn't do so because people started to ask me if I were gay. I'm straight and even I can't stand it because it makes me and others feel like it is unacceptable to befriend GBLST people. Some of my best friends are bi, and you know what IT'S OKAY! And none of them are the stereotypical "Gay Best Friend" who likes clothing and shopping, they have told me before that they wish fiction could portray someone more realistically. Thanks for the blog post. It had to be said.